Some people get lucky on the lottery. I got lucky just over a year ago when I received an email from a guy called Andy Barnes. He runs Perfect Pitch, a company devoted to creating and supporting new musicals. ‘We were wondering if you’d ever thought of adapting your book Lia’s Guide to Winning the Lottery into a musical?’ he wrote. Well, no, I have to admit that I’d never given it a minute’s thought, my daydreams being more about Hollywood blockbusters. And, err, winning the lottery. But as soon as I read the email I had visions of a big department store number with flying shopping bags and clashing stilettos. I liked the idea even more when I met Andy and the rest of the Perfect Pitch team and they shared their idea of singing lottery balls. They showed me clips from a workshop they’d held with students from the Musical Theatre Academy, a college in Islington. My characters, singing and dancing…it was like magic. I’d written Lia’s Guide in 2010, setting myself the challenge of making a book about personal finance attractive to teenagers. It’s a book about chance and fortune, relative values and valuing your relatives. It’s about being very rich and very poor. Because ‘dark romance’ dominated teen fiction at the time, I added in a moody, mysterious love interest, a boy who was almost definitely a vampire, an angel or a lovely, fluffy werewolf. I’ve learned a lot in the last few months as we set about turning the book into the show. I’ve learned to let go of characters who worked fine on the page but are dull or peculiar on the stage. I’ve grappled with lyrics, and learned to love stage directions. I’ve learned that writing a musical is more like my previous existence as a news reporter than my current one as an author of teen fiction (the team work, the brutal deadlines, the swingeing cuts). I am a print-media person. I work with words on paper, I work for readers. Learning to think about staging, about how words sound, how an actor will interpret them, how to get people on and off a stage – it doesn’t always come easily. But it’s exciting to feel as though you are learning, and to be trusted with the opportunity to have a go. I’m very lucky in that Perfect Pitch partnered me with Paul Herbert whose music is so wonderful that I’ve quite often wanted to cut all the dialogue so we can just have back-to-back songs, and I’ve also been privileged to work with brilliant directors Ryan McBryde and John Brant, and choreographer Lizzi Gee. Tonight is the first night of a run of performances of the show, performed by those talented students of the MTA, many of whom took part in that initial workshop. It’s a developmental version – changes will happen afterwards, but it’s come on a long way from the first version of the musical, put together with the help of a valiant bunch of students in Carlisle who work shopped the first stages of the script. I hope Lia brings them all the luck they deserve. I’m making a list of stars of the future, and will be boring people for years now with my tales of how I knew the big names of musical theatre when they were just starting out. It’s on at the Bridewell Theatre, just off Fleet Street, just around the corner from where I started my career in journalism 32 years ago (I was a child reporter!). 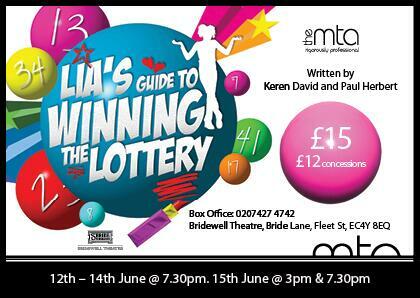 Fittingly, Lia the musical, even more than the book, is about journalism. It’s about misunderstandings and misinterpretations, gossip and mis-reporting, the courage it takes to tell the truth. I’ve neglected this blog in recent months because I’ve been writing the musical, and two books as well. I hope that anyone who comes along will think it’s been worthwhile! Details here. Congratulations, I hope it goes really well. The class you talked to about the musical loved writing the begging letters they wrote to Lia and our copies of the book have been passed around other classes by those students.